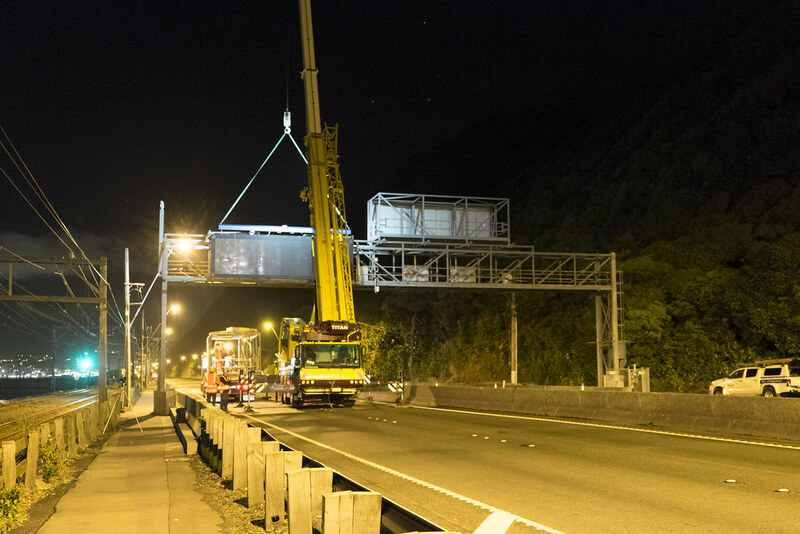 The changes we made to the section of State Highway 1 between Johnsonville and the Terrace Tunnel in Wellington turned it into New Zealand’s first ‘smart motorway’. The section of State Highway 1 between Ngauranga and the Terrace Tunnel is Wellington’s busiest section of road, used by around 100,000 vehicles per weekday. Smart motorways improve safety and reduce congestion by carefully controlling the flow of vehicles. The key is smoothing the flow of traffic and reducing sudden braking which causes a domino effect on following traffic. Detectors and radars count vehicles and measure their speed. The smart system calculates the rate at which the road is getting congested, factors in what’s likely to happen based on traffic records that are continually updated and monitored, and then adjusts the speed limit to pace the traffic and delay queues being formed. The most critical time when the smart system can influence the severity of congestion is as the traffic volume begins to build, i.e. before the road becomes congested. The smart motorway doesn't get rid of congestion altogether, but it does improve safety and travel time reliability during peak times. Data on traffic patterns is used to fine-tune the computer programme that sits behind the smart system to ensure it’s managing the motorway effectively. This learns over time to translate data into the optimum speed to keep traffic flowing. Varying travel times make it hard to plan. With the improvements that come with the smart motorway, not only will the length of time taken to drive that stretch of road reduce, the consistency of your journey time will improve too. The smart motorway will improve safety in two ways; it’ll reduce the number of crashes (because smoothing the traffic flow reduces the likelihood of disruptive nose-to-tail crashes) and it’ll minimise the impact of crashes that do occur (due to new features that better manage traffic flow). Congestion adds extra cost and time, as well as stress, to individuals, businesses and to the economy as a whole. Smart motorways reduce congestion by keeping vehicles flowing smoothly. Traffic congestion can be very stressful for those stuck in it, especially when you need (or want) to be somewhere else. The smart motorway will reduce congestion and traffic will flow more smoothly. Everyone will get where they’re going sooner and more safely. Then everyone’s happy. Vehicles in congested traffic use extra fuel and create more emissions; costing your pocket and the planet’s wellbeing. This means congestion is more than just a stressful inconvenience so the Transport Agency is constantly looking at ways to reduce congestion wherever we can. The smart motorway concept allows us to make the maximum impact on your journeys without the costs associated with building a whole new road. 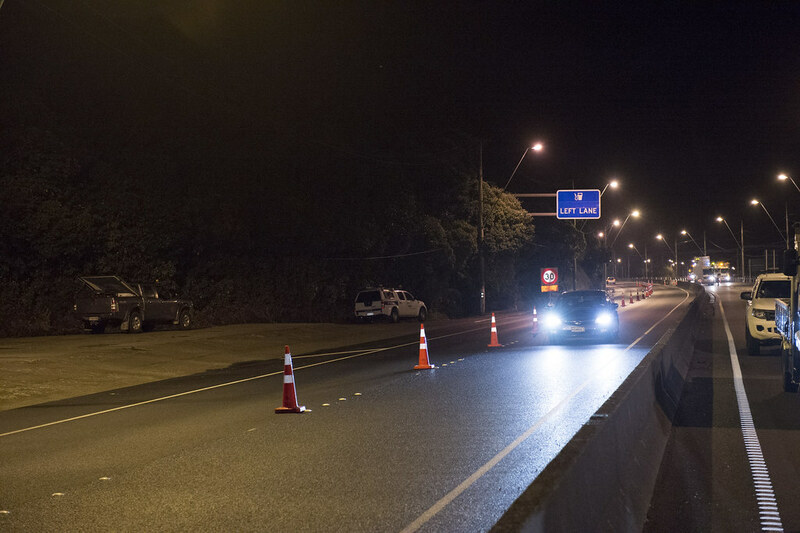 By making relatively minor changes to what we already have, we can create another northbound lane from the Aotea on-ramp to the State Highway 1/State Highway 2 split. Innovations like this work alongside the smart system to give you the best journey and the best value for money. Here you can access all our Smart motorway information to help make your commute smoother. A smart motorway is fitted with a network of detection equipment (radars, loops and cameras) and electronic signs that are programmed to respond automatically to manage the flow of traffic. As the volume of traffic increases, the smart motorway automatically adjusts the speed limit to reduce congestion and get as many vehicles as possible through the area. They’re used effectively around the world as transport agencies seek to improve people’s journeys while getting the most out of existing road corridors. When all the parts come together, the stop/start nature of congestion is reduced, traffic moves more smoothly, more vehicles get through a section of road and everyone gets where they’re going sooner and more safely. Smart motorways reduce congestion by carefully controlling the flow of vehicles. The most critical time when the system can influence the severity of congestion is as the traffic volume begins to build, ie before the road becomes congested. Detectors under the road and radars mounted on lighting poles and gantries count the number of vehicles in each lane, as well as the speed they’re travelling. The smart system calculates the rate at which the road is getting congested, factors in what’s likely to happen based on traffic records that are continually updated and monitored, and automatically adjusts the speed limit to pace the traffic and delay queues being formed. Watch our video to see how pacing traffic flow gets more vehicles through. Drive the smart motorway with Traffic Scientist Kevin McPhee as he explains its features and how they'll work to get you where you're going smoothly and safely. Stick to the posted speed limit (the posted limit is the legal limit) – the smart system calculates the optimum speed to minimise congestion and to get the maximum number of vehicles through the area. As well as breaking the law, exceeding the speed limit will just get drivers to the back of the queue faster and just increase the size and duration of the queue. Minimise lane changes – changing lanes can have a shockwave effect on following vehicles. If everyone stays in the lane where possible, traffic moves smoothly and everyone gets where they’re going sooner. Variable speed limits are at the core of our smart motorway. In fact, setting the variable speed limit is actually the smartest smart bit of the whole smart motorway. Watch this animation to find out how variable speeds work and why it's important all drivers do their bit by sticking to the displayed speed limit. Because there is no shoulder on the northbound lanes, two emergency stopping areas will be built. Normal motorway rules apply; it’s illegal to stop in an emergency stopping area for any other reason than an emergency. The stopping areas are fitted with sensors, cameras, and a phone which connects straight through to Wellington’s Transport Operations Centre (WTOC). Operators at the WTOC are alerted when a vehicle stops in the emergency stopping area and could send a road policing officer to check out the situation. Once a vehicle is ready to leave the emergency stopping area, WTOC operators can use the red X to close the lane allowing the vehicle time to get up to the speed of the main traffic flow. Wellington’s Transport Operations Centre (WTOC) is staffed and managed in partnership between the Transport Agency, Wellington City Council, Greater Wellington Regional Council and other councils. It’s objective is to provide a round the-clock service to help travellers get where they’re going as smoothly, safely and quickly as possible. WTOC operators monitor and manage a considerable proportion of the country’s state highway and regional roading network providing accurate, real time travel information and advice and working with our partners like emergency services to manage incidents. WTOC has a special focus on Wellington’s smart motorway – the region’s busiest section of road. The smart motorway system includes a range of operating procedures that ensure events are managed correctly and consistently. The procedures set out the steps operators must take to manage a range of situations, eg when someone stops in an emergency stopping area or when roadworks are happening on the motorway. While setting the speed limit on the smart motorway is automated, WTOC operators monitor the motorway through the network of cameras and detectors to ensure incidents are cleared as quickly as possible to keep people safe and traffic flowing. They set the messages that appear on the electronic variable message signs, and use the lane control signs (the Red X or arrow) to direct traffic on which lane to use. air quality in Wellington’s Arras, Terrace and Mount Victoria tunnels. WTOC also serves another valuable purpose; it’s a major civil defence and emergency management hub for Wellington, the lower and central North Island. From a breakdown to an earthquake, the WTOC is at the centre of keeping you, your family and friends informed and safe. For an overview of the parts that make up the smart motorway, take a look at these smart info sheets. Why did the Transport Agency build the smart motorway? The motorway between Ngauranga and the Terrace Tunnel is the busiest section of highway in the Wellington region. Its issues include severe congestion at peak times and a relatively bad safety record. Investigations determined the best way to improve people’s journeys was to improve capacity, ie add an extra lane in each direction and develop the smart motorway system. 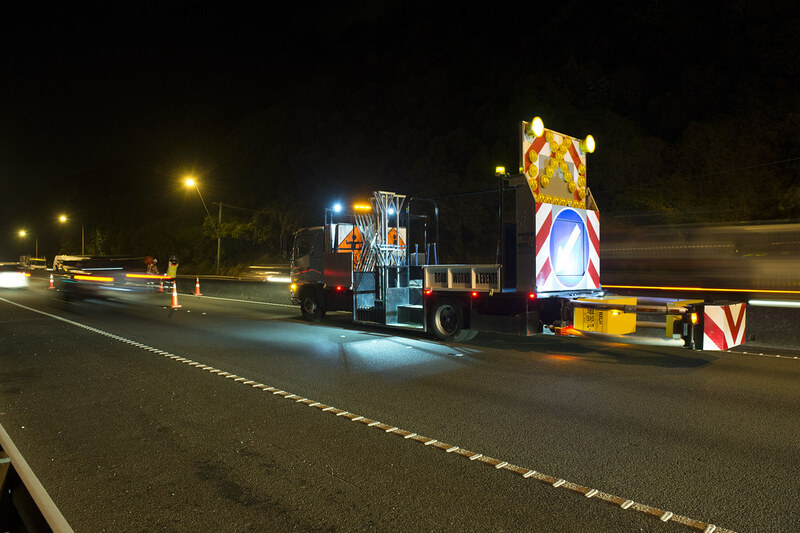 The work is being done in stages; stage one - improving the State Highway 2 northbound on-ramp - was completed in June 2013; stages 2 and 3 – adding the smart system and adding an extra northbound lane to State Highway 1 between the Aotea on-ramp and Ngauranga - was completed in July 2016. What’s different about driving on a smart motorway? The variable speed limit – you might see the speed limit change more frequently that you’re used to. That’s because the smart motorway uses variable speed controls to smooth the flow of traffic and maximise the number of vehicles that can get through during peak travel times. The speed limit displayed on the electronic speed signs is the legal limit and while it can be confusing slowing down before you see congestion, that’s where the driver’s smarts come in. As well as following the displayed speed limit, smart drivers minimise the number of times they change lanes and merge like a zip. Two emergency breakdown areas - on the northbound side of the motorway. Normal motorway rules apply; emergency stopping areas are for emergencies only. They’ll have sensors, cameras, and a phone which will connect to Wellington’s Transport Operations Centre. When a vehicle is ready to leave the emergency stopping area, operators will display the upstream Red X to close the lane, allowing the vehicle time to get up to the speed of the main traffic flow. How will the smart motorway make my journey better? When everyone does the right thing, ie follow the signs and minimise lane changes, the smart motorway will smooth the flow of traffic so more vehicles get through. Journey times will be more reliable and safer. How will the smart system make the motorway safer? The smart motorway will improve safety in two ways; firstly it’ll reduce the number of crashes (smoothing the traffic flow reduces the likelihood of disruptive nose-to-tail crashes) and it’ll minimise the impact of crashes that do occur (with new features that better manage traffic flow). 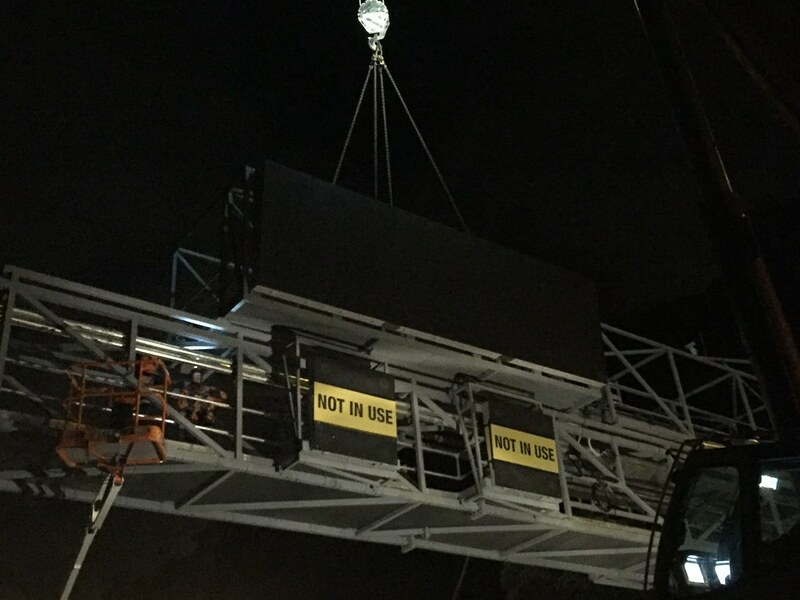 Features on the smart motorway that’ll improve incident management include two northbound emergency stopping areas drivers can pull their vehicles into if they get into trouble. The emergency stopping areas are monitored by sensors and a camera and there’s a phone which connects directly to the Transport Operations Centre. If a vehicle stops before it can reach an emergency stopping areas or when there’s a crash, operators can use the Red X on the electronic variable signs to a close lane. Operators can then display the arrows on variable signs further back in the traffic giving drivers plenty of notice to change lane before they come upon the stopped vehicle. A closed lane also allows emergency services to reach and clear the stricken vehicle sooner, reducing the delay to other vehicles. A recovery vehicle is posted near the smart motorway during peak travel times. This allows it to respond immediately if a vehicle needs to be towed away. Removing a stopped vehicle quickly keeps traffic flowing and removes a safety hazard.